Despite advances in health, the incidence of mortality in India, owing to childbirth-related causes, inadequate neonatal care and childhood diseases, continues to be very high. Of the over 1.3 million deaths every year of children below the age of five, a large number is caused by diseases like diarrhoea, pneumonia and measles that can be prevented by vaccination. Some districts have an under-five child mortality rate (U5MR) that is higher than that of sub-Saharan African countries. For example, Rayagada in Odisha has the highest U5MR of 133 deaths for 1,000 live births. And this is despite India having the world’s largest immunisation programme largely available free of cost. Even though India’s Universal Immunisation Programme (UIP) is the largest in the world in terms of the number of beneficiaries as well as the quantity of vaccines used, there is still a huge unreached population of 7.2 million out of the total 27 million children born annually. Assam, Bihar, Madhya Pradesh, Odisha, Rajasthan and Uttar Pradesh have immunisation levels lower than the national average. Lack of awareness, insufficient information as well as misperception about vaccination among some parents contribute to the lukewarm response to routine immunisation schemes initiated by the government so far. The problem is further compounded by the inadequate public health system that does not have sufficient reach in some areas. Between 2009 and 2013, the immunisation coverage increased from 61 to 65 per cent, that is, with an increase of 1percentage point per year. With 35 per cent of children still not receiving any or partial immunisation coverage, the government has adopted a mission mode, via Mission Indradhanush, to immunise all children by 2020 against seven vaccine preventable diseases, namely, tuberculosis, diphtheria, pertussis, tetanus, poliomyelitis, measles and hepatitis B. But a lot more needs to be done. India is lagging in meeting the challenge of the Millennium Development Goals (MDGs) with respect to targets to reduce the incidence of infant and under-5 child mortality rates. It is ultimately up to the political class to rise to the challenge of raising awareness on the issues of childhood diseases and health. Political will is needed to put the cause of child survival high on the list of the governance agenda. Only that can ensure better coordination among various government departments that today work separately on preventive measures like hygiene, sanitation, nutrition and immunisation. The successful eradication of polio, with India not reporting a single case for the last four years, has raised hopes that life-saving interventions can be replicated for other preventable diseases. But that will not happen on its own. It requires decisions to be taken and implemented. Now that we have tasted success with polio, we must boost routine immunisation by strengthening the health systems in terms of reach, quality, cost effectiveness and the introduction of new vaccines in the immunisation portfolio. For this, increased fiscal allocation is a must. 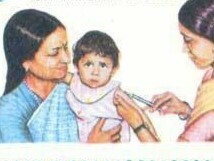 Immunisation can not only stem the vicious cycle of infectious diseases but also impact other aspects of child health. Let’s look, for instance, at the link between immunisation and malnutrition. There is a growing body of evidence that vaccines can help prevent some of the chronic consequences of malnourishment. A recent study showed that children receiving the full immunisation coverage are less likely to display signs of stunting. Malnutrition has deleterious effects on the overall development of the child, extracting a lifelong toll of negative economic consequences. Immunisation, then, also becomes a key strategy to help check the incidence of malnutrition and its long-term consequences, and thus has a crucial role if India is to really benefit from a demographic dividend. In addition to initiatives that target the public health delivery system directly, key investments need to be made also in strengthening the hands of other stakeholders, like domestic pharmaceutical companies. Indian vaccine manufacturers have already established a global presence, supplying, for example, a staggering 90 per cent of all measles vaccines worldwide, as well as half of the World Health Organisation (WHO) demand for DPT and BCG vaccines against tuberculosis. Appropriate government policies must incentivise Indian vaccine companies to enhance their manufacturing capabilities as well as R&D capabilities. Government programmes, such as Make in India, can achieve these objectives by encouraging the transfer of those technologies and knowledge that are necessary for the autonomous development and manufacture of vaccines for both domestic and international markets. Since India’s own domestic consumption of vaccines is also high, as is the case with the international markets it serves, this would be a win-win proposition. The timing of such a policy-led boost can be crucial. Recently, there has emerged an uninformed but powerful anti-vaccination movement in the West that threatens to set back decades of health gains. Measles is making a comeback in the US, following several years of reduced vaccinations. This has happened due to uninformed parents being influenced by the anti-vaccination rantings of self-styled gurus and celebrities. Fortunately, the likes of Hillary Clinton are pushing back, pointing out the overwhelming scientific evidence in favour of vaccines. Against this backdrop, a bold, renewed commitment by India to the immunisation imperative will help us deal with our own less than satisfactory record of combating childhood diseases. And considering the looming year-end review of the MDGs, India has a window of opportunity to take a leading role in setting the global agenda on child health. © 2012–2017 Baijayant 'Jay Panda'. All Rights Reserved.